California instituted several programs to curb urban and residential water usage, such as the “Flex Our Water” campaign http://www.saveourh2o.org/. Many of the tips and best practices include using localized plants, creating a water plan, and maintaining water systems. Artificial Turf represents an alternative solution to curb outdoor water use and maintain the beautiful green lawn cherished by homeowners. In the past, artificial turf found it’s home in sports arenas. Recent product advancements bring the synthetic ground-cover into residential spaces. Artificial turf used to create fake-looking lawns spotted from a mile away, and were not generally considered a wise design choice. Softer and more realistic than ever, it’s hard to tell the difference between artificial and real grass in a side by side comparison. For me the secret is in the thatch. The term “thatch” describes the organic material in natural grass that builds up over time. Lawn clippings, dead grass, leaves, and sticks from nearby foliage make up this organic ground cover. Artificial turf generates no waste and requires no maintenance, but also contained no thatch. Until now. Responding to market pressures, manufacturers began creating synthetic turf with thatch included (see figure 1). Coming in brown, green, or both, the thatch looks full and healthy. The reader would be right. Synthetic grass used to be hard. Advances in product manufacturing, however, make synthetic fibers softer than ever. An artificial lawn can actually be softer than a real lawn. Un-watered lawns become crispy, but artificial turf stays soft and green 365 days a year without pesticides, fertilizers, or water. Environmental impacts of synthetic grass often concern home owners. Does this new style of turf hurt the planet? Artificial turf excels in many areas of environmental sustainability including water runoff, protecting native soil bacterias, and recycle-ability.The perforated backing on artificial turf allows water and air to pass freely through the grass. This would sustains the natural organisms in the soil, and avoid flooding during rainy seasons. Also, the gravel and sand base which supports the grass helps maintain the flow of oxygen through air and water to the soil. The gravel absorbs water more quickly than native soil and helps reduce water runoff and flooding. Manufacturers often use recycled materials to make synthetic grass, and artificial turf can be recycled after it’s life in service. What a great list of features! 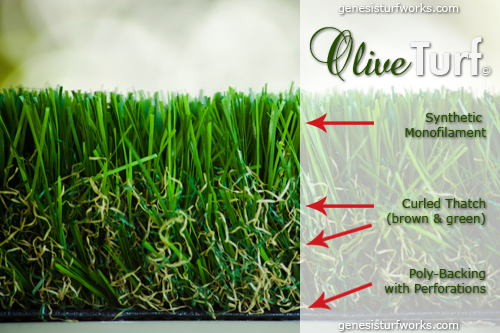 If you’re interested in learning more about artificial turf, or want to install at your home, visit genesisturfworks.com or call 888.389.5533. We’d love to share our enthusiasm about this wonderful product! This is some really great advice for anyone looking to make their home and lawn a lot more efficient and environmentally friendly. I liked your point about thatch, because it makes sense that we are so used to grass having that layer, that when artificial grass doesn’t it’s off-putting and doesn’t feel real. And it’s interesting to learn how they have replicated that thatch with the curls of brown and green strands around the base. Thanks so much for writing! I think that getting turf is a great idea. I’ve contemplated it for some time now. Like you say, it can reduce our use of water drastically. I’m going to talk to my wife more about this. It would always make our grass look great!